Why not brighten up someone’s existence with this vibrant bouquet of yellow Asiatic Lilies and bright pink Gerberas. Guaranteed to put a sparkle in anyone’s eyes ! 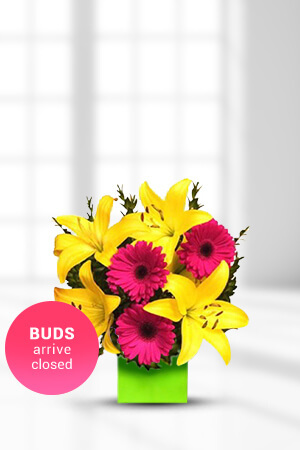 Lilies may be sent closed/partially closed in order to prevent damage and to last longer - Vase not includedThe vase in the picture is not included, however if you would like to make your flower gift extra special, why not add a vase to your order? We recommend a Premium Vase to leave a lasting impression. Very easy, no fuss and reliable.